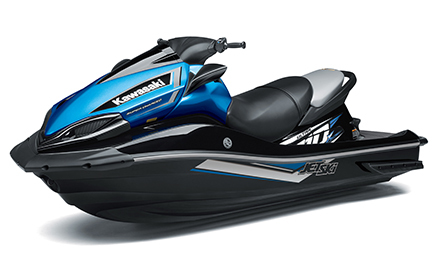 Kawasaki Ultra 310X, NEW 2018 model. PACKAGE on Dunbier Roller Trailer, 3 X PFD2 Lifejackets, Fogging Oil, Trailer Tie-Down, 12 months NSW Registrations. 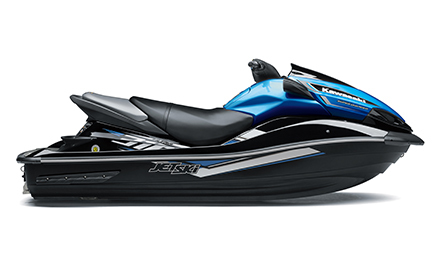 REGISTERED JET SKI ONLY NOW $16,990. BELOW COST. NEW 2018 STOCK. To suit the 160 mm jet pump, the Ultra 310X gets an impeller designed to efficiently convert all the extra power into forward thrust. 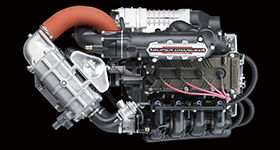 The pump impeller features a high-efficiency 3-blade design that gives the 310X great initial acceleration. 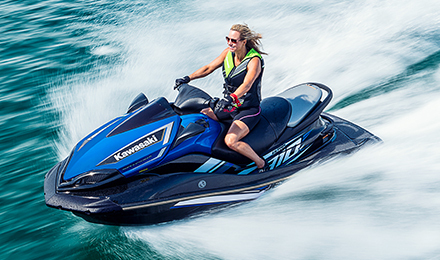 The 310X’s Kawasaki Splash Deflector (KSD) uses three bottom-mounted ridges and an additional deflector mounted at the top to deflect water splashing forward from under the hull. Whether turning or straight-line riding at any speed the Quattro KSD minimizes spray, allowing greater rider concentration. 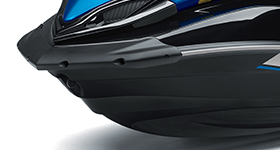 The reinforced inner bow is extremely light with ample strength to handle the engine’s power output. Exemplary straight-line tracking and responsive handling in both calm and rough-water conditions set performance benchmarks for the class. 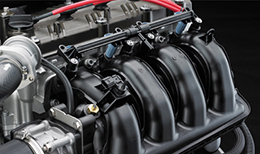 The lower hull is specially designed to distribute the engine and power delivery loads over a wide area. The bottom of the hull slants upward steeply from the center section to the bow, so the 310X can penetrate swells and waves with less shock, pushing through waves rather than bouncing over them at high speeds. Integrated sponsons extend from the hull, providing wallow-free straight-line performance and contributing significantly to the 310X’s excellent manoeuvrability while helping to retain the narrow hull design. To effectively convert the 310 PS output into thrust, the Ultra 310X utilises a large 160mm jet pump, designed using eight guide vanes. The pump delivers superior “traction” in rough water conditions and significantly contributes to the Ultra 310X’s mind-boggling acceleration. 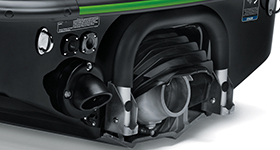 The pump is designed to deliver consistent output and good “bite” even in rough water conditions. 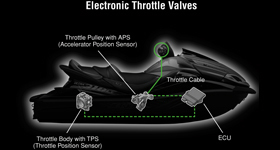 the pump impeller features a high-efficency 3-blade design that gives the 310X great initial acceleration and the eight-vane intake guides and regulates the flow of water to the impeller for consistent, efficient and powerful propulsion. 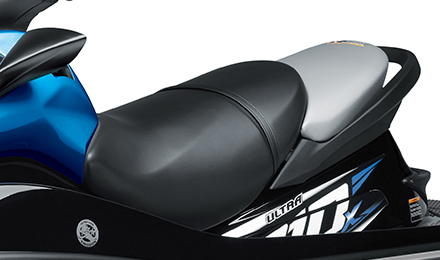 The Ultra 300X features a 4-into-2-into-1 powerboat-style exhaust system, which routes the exhaust pipe upwards. 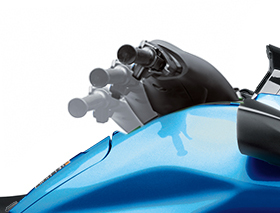 This allows the smoothest flow for exhaust gases, maximising exhaust efficiency. 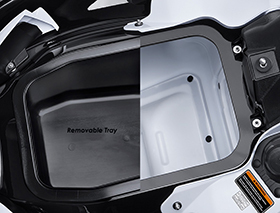 The huge class leading front storage compartment comes with removable tray combined with a center-console storage area. Compact integrated under-seat storage area is ideal for tools and other small items. 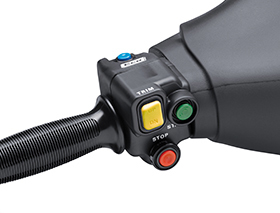 The ECU controlled ETV allows multiple riding mode options to be activated with the touch of a button. 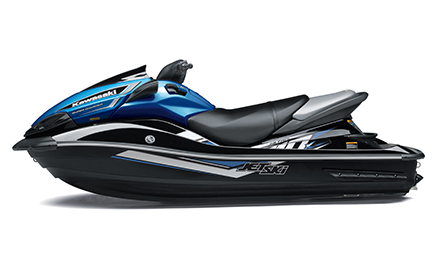 8 kph mode conveniently regulates rpm to maintain constant speed in no-wake zones and cruise control fixes speed at a specified level for convenient long distance touring. An ergonomic deck design gives plenty of legroom and the left-side reverse lever is ergonomically designed for easy operation. At the end of the day on the water a quick and easy hose connection allows a simple method to flush sea water out of the engine. 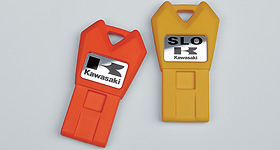 Eco Indicator shows the rider when the speed and throttle opening is in the 310LX’s most efficient range. 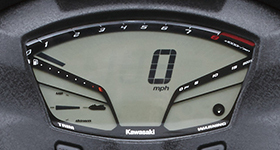 The Kawasaki Eco Mode reduces and smoothes engine performance while conserving fuel.